Saanen is a small charming ski resort with chalet buildings in the town centre dating back to the 15th to the 18th century. This historical town is listed among the townscapes of Switzerland for protection of its traditional authenticity. The ski area in Saanen area is known to be one of the safest and largest skiing areas in Switzerland. Saanen is part of the Gstaad Ski area with access to extensive skiing: 325km of downhill skiing, with 144 individual pistes, served by 57 ski lifts. Saanen ski resort guarantees a fun-filled ski holiday! Saanen is located in Bernese Oberland region, Switzerland. Town of Saanen is the municipal capital of the Obersimmental-Saanen district. Saanen is a nice, quiet village with 1800 permanent residents, only 4 km west of Gstaad. The Saanen and Gstaad holiday region is situated right on the border to the French-speaking part of the country. Nestled in a beautiful Alpine landscape, this beautiful village combines history with recreation in these historic ski towns. Saanen is not the cheapest choice for a skiing holiday, but the accommodations there are generally simpler and slightly cheaper comparing to Gstaad. You can find a lot of gourmet restaurants, shopping malls and all kinds of theme parks in Saanen. Plenty of other sports activities are available in Saanen including hiking, biking, winter walking, valley runs into Gstaad and La Videmanette end others. There is a train station in Saaren, which is only a couple of minutes walking distance from the city centre. Switzerland is known for its efficient rail network, but we still recommend you to order direct airport transfer to get to your chosen destination. That is the most convenient and time-saving option. We always carefully calculate all resort transfer services individually, to ensure that our customers never overpay. Whenever you choose to travel and whatever your final destination, Alps 2 Alps will get you there for the best possible price. However, we advise booking early to access the best possible deal. In addition, keep up to date with Alps 2 Alps for the latest offers, deals and discounts on Saaren resort transfer services. All of the above will only ever result in our base-rate for ski transfers going down – we never over-inflate our prices at any time or for any reason. We also offer substantial discounts for off-peak, off-season and midweek transfers to Saaren. If looking for the best possible deals, travelling outside peak season or midweek typically results in the biggest savings. We offer midweek (Monday to Friday) prices with up to 60% discount than weekend prices. Your transfer quote will also depend on vehicle availability, transfer schedule, vehicle utilisation and other costs like road tolls and airport parking charges. In all instances, we work hard to keep our prices low and are relentlessly committed to total value for money. Which is why we guarantee you won’t find a better deal on your Saaren resort transfers, whatever your needs. The resort of Saanen lies at an elevation of 1,050m, with a max vertical of 1,950m and its highest lift going as far as 3,000m. 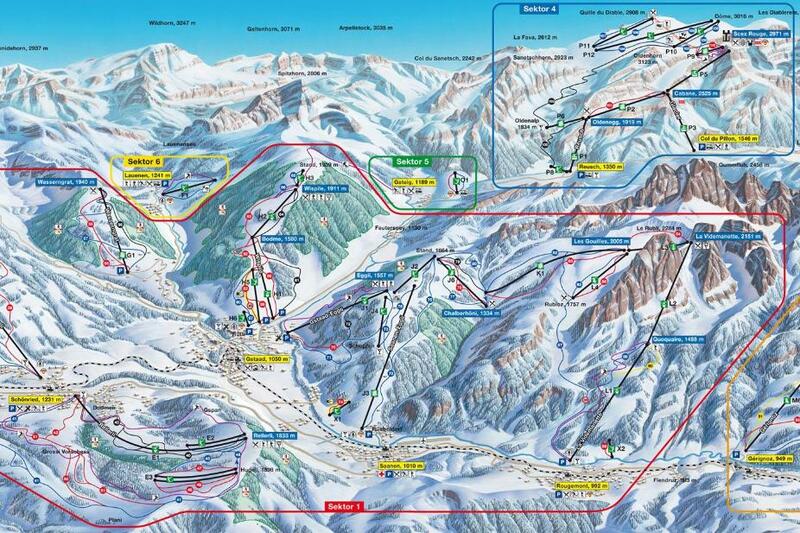 There are a total of 144 pistes in the immediate vicinity of the resort, served by 57 ski lifts. Around 60% of the slopes are ideal for beginners, 30% serve the needs of intermediates and the remaining 10% are far more challenging. Saanen ski area is part of the Gstaad ski region accessible with a single pass. With the appropriate ski Lift Pass, you will be able to ski or snowboard in the other Gstaad Mountain Rides ski resorts of Chateau d’Oex, Gstaad, Saanenmoser, Schonried and Zweisimmen. Snowboarders and freeride skiers can enjoy 4 fantastic fun parks in the ski region Gstaad Mountain Rides. Gstaad resort has the only glacier ski area in the Bernese Oberland region. Families feel that they are welcome in Saanen ski area. The resort has a unique specialized children's ski school: Schweizer Kinderskischule Saanen and family-friendly ski lifts. Most of the beginner slopes are also very suitable for families. Special winter camps are offered – kids will be fully supervised in an all-inclusive camp program, while parents will be able to enjoy their ski holidays (Lovell Camps). The way we see it, Saanen resort transfers are about so much more than getting you to your final destination. After all, you also want to arrive comfortable, refreshed and ideally on time. Not all resort transfer services can promise this – Alps2Alps guarantees a higher-level service for every passenger. Keep an eye on the hot deals, discounts and special offers that could make your trip even more affordable. If looking to secure your seats for the best possible price, booking as early as possible is advisable.